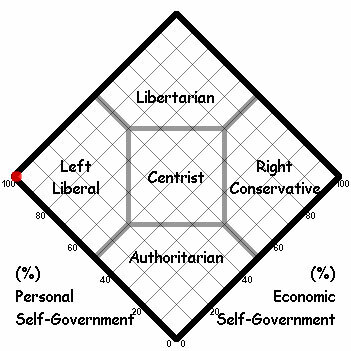 According to The World’s Smallest Political Quiz, i’m an out and out leftie. Even though this goes against the findings of more detailed quizes taken in the past (see Holier than Thou), i’m now a legitimate target for the The Leftie Insult Generator. A Whatfettle article by Paul Downey published Saturday, June 26th, 2004, at 6:22 pm under a Creative Commons License.